The modern consumer is different to the consumer of a bygone era. Of course, it has always been important to build relationships with customers, but how we do this has completely evolved. In times gone by the only communication, you would have with customers is when they entered your store. While of course, being friendly with customers is still vitally important, it is now only part of a much more complex puzzle. In 2017, building a relationship with customers begins long before they enter your store. Many stores will have adapted somewhat and built a brand spanking new website for their store, but in truth, your website isn’t where you connect with customers. Social media is where many brands now interact with customers and it really is a great way to build strong relationships with them, long before they enter your store. 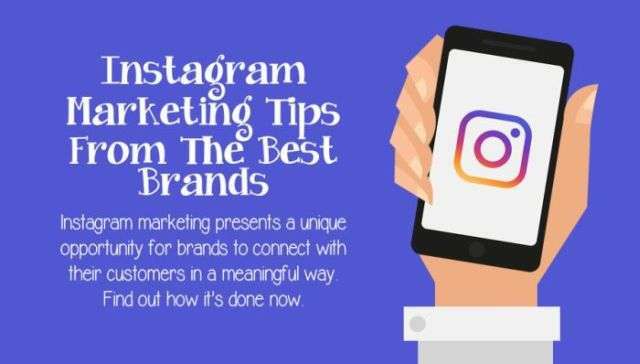 This “Instagram Marketing Tips From The Best Brands” infographic from M2 On Hold takes you through what to keep in mind when promoting your business on Instagram. Its primary focus is on how effective Instagram marketing can be for your business and it makes for an interesting read. Some readers might be using Facebook already and while this is a good idea, it generally isn’t nearly as effective as Instagram. We’re not saying to forget about Facebook but maybe just don’t put all your eggs in one social media basket. Brands on Instagram enjoy a 3%-6% engagement rate with their total followers while Twitter and Facebook engagement can be as low as 0.1%. People just seem to be more engaged on Instagram and the numbers really do speak for themselves. The other great thing about Instagram is that you’re interacting with a lot of 18-29-year-olds. In fact, 53% of Instagram users are between the ages of 18-29 with another 25% between the ages of 30-49. Getting the basic profile set up should be straight forward enough. Do the basics first and then you can start thinking about how to use Instagram to market your business effectively. However, setting up your profile is the first step in the process so get this done now and think about the rest later. So, how should you market on your Instagram? Many people reading this might have never used Instagram, but the learning curve really isn’t too steep. Have a look at the common goals in the infographic and try to focus on achieving one or two of those. Don’t create an Instagram that is a complete mishmash of different ideas and tries to make your message simple for customers to understand. You might be thinking to yourself, ‘No, my company isn’t really suited to Instagram, it’s just a simple business.’ Well, that didn’t stop FedEx creating an amazing Instagram page of their delivery drivers ‘out in the wild’. Any brand who has great packaging or branding is also absolutely perfect for Instagram. For example, Califia Farms are famous for attractive packaging so their page looks fantastic with pictures of their product featuring heavily on it. The important thing to remember is to do more than just promote your company. Don’t just tell your customers to buy, buy, buy but rather talk about your brand and tell them why, why, why they should do business with you. If you are including some advertising, include it as part of a post and don’t make it the entire focus. Find out more about marketing on Instagram in the infographic and at the very least create an Instagram page for your business and start interacting with your customers. Don’t delay any longer because your competitors are likely already utilizing Instagram on a daily basis.